Ghent, or rather ‘Gent’ we love it; the bars, the people and the fact you can walk into a filling station and there are six quality cycling magazines on the shelf to chose from. And you have to love a city where they have taps to discharge the rainwater. 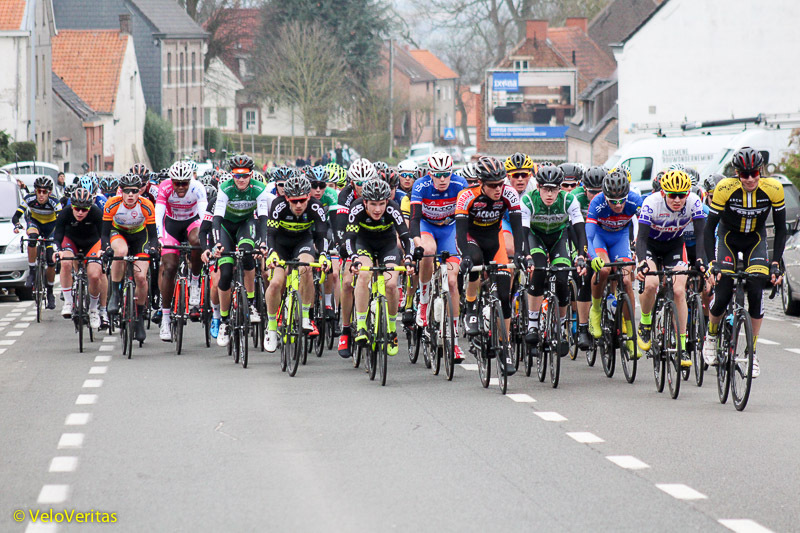 Omloop Het Nieuwsblad and Kuurne Brussels Kuurne, the first real races of the year – Down Under, the Desert races, Langkawi? It’s always nice to skek the new kit which is on show at Het Nieuwsblad; not so long ago you could have Campag or Shimano brakes then along came SRAM – well, now you can even chose which FSA calliper you go for. We DON’T like this, number behent the seat, how the heck are you meant to identify who’s who? Shoulder numbers may not be cool but they do the job. And we’re sure the mechanics don’t like this, back brakes tucked under the bracket to catch everything the roads of Flanders have to offer. This is one of the Bahrain Meridas, nice machines – brake position apart. Just another snapper? Nope, former Tour de France stage winner, Netherlands Champion and Worlds medallist, Leon Van Bon who’s now a pro photog. 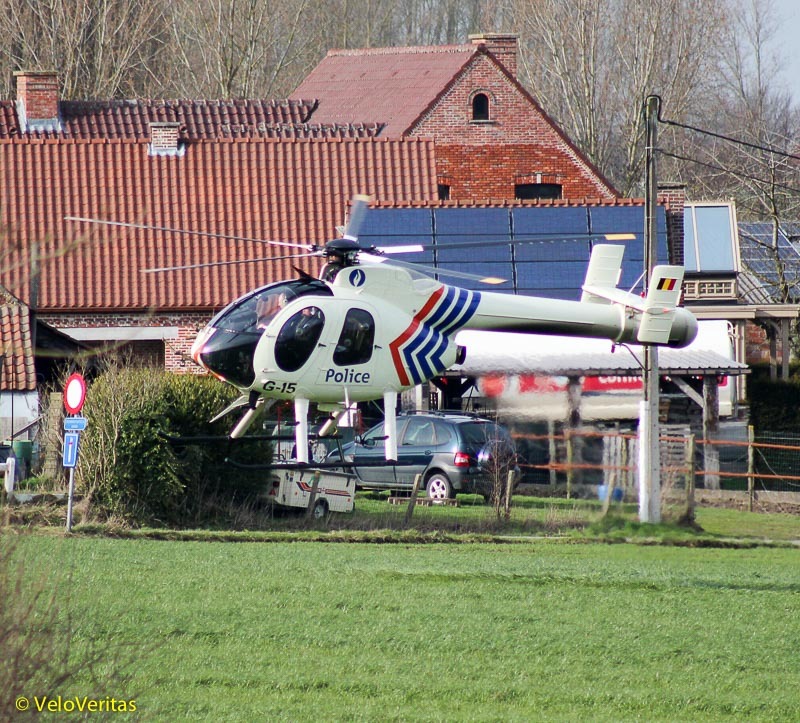 Boonen – we’ll miss him but maybe it’ll be easier to get around the QuickStep bus after his final Paris-Roubaix? He’s a God in Flanders – and rightly so, his palmarès speak for themselves and he oozes charisma. The sport will be the poorer without Tomeke. 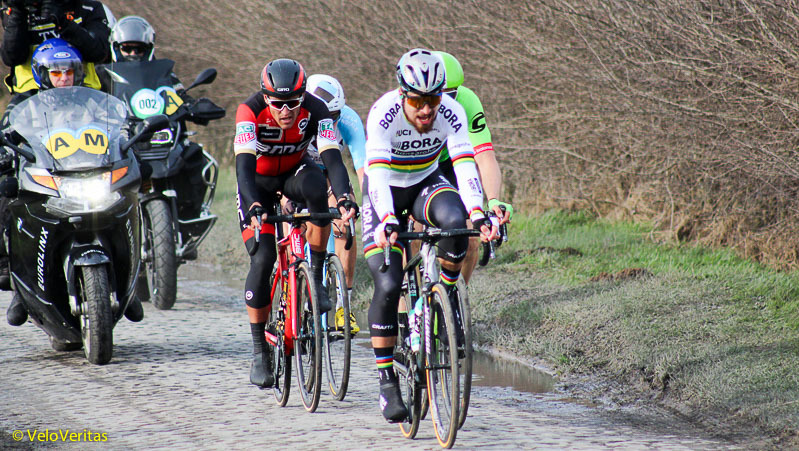 But the people of Flanders have taken Sagan and his eccentric ways to their heart – it was almost as difficult to get close to him as it was to Tom. He had to have stewards clear a passage to the sign on for him. It’s always a bit confusing at the early races with riders in their new liveries. Big Guillaume Van Keirsbulck has been a QuickStep stalwart for years, spending thousands of kilometres on the front – but this year he’s moved across to Pro Continental Wanty. A good move too, with victory in Le Samyn coming just days after Het Nieuwsblad for the big chap. 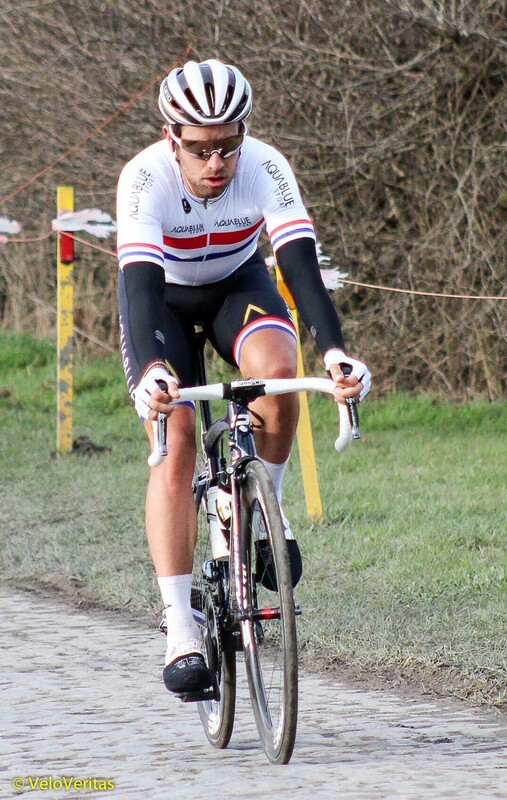 Dan McLay looks like he belongs in the Classics, big and strong – the Omloop is too hilly for a man of his build but we had hopes for him next day in Kuurne. Think what you like about Astana – but their team car reminds you that they have done the biz. World Champion Classics riders don’t sit in and wait; they attack, forge on, shape the race and sometimes they don’t win – but the way they ride makes for proper bike racing, not that formulaic stuff which has become the norm. Tony Martin is another man who’s changed simits for 2017, despite his huge power he’s never pulled off a big result in a Classic. 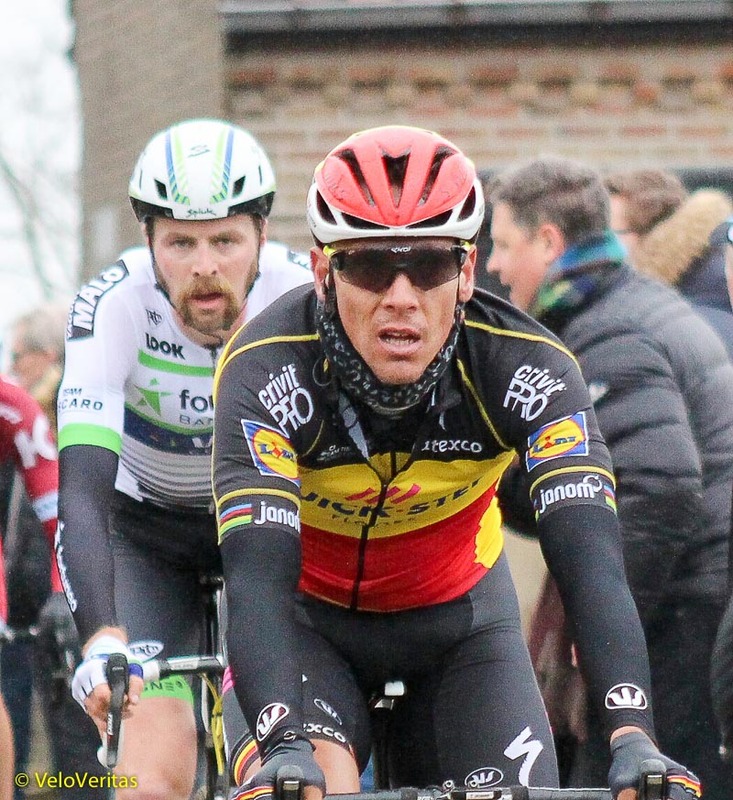 He wasn’t having fun on Saturday when we spied him on the Haaghoek cobbles. Having even less fun was big Max Walscheid – on the rim over cobbles, ouch! 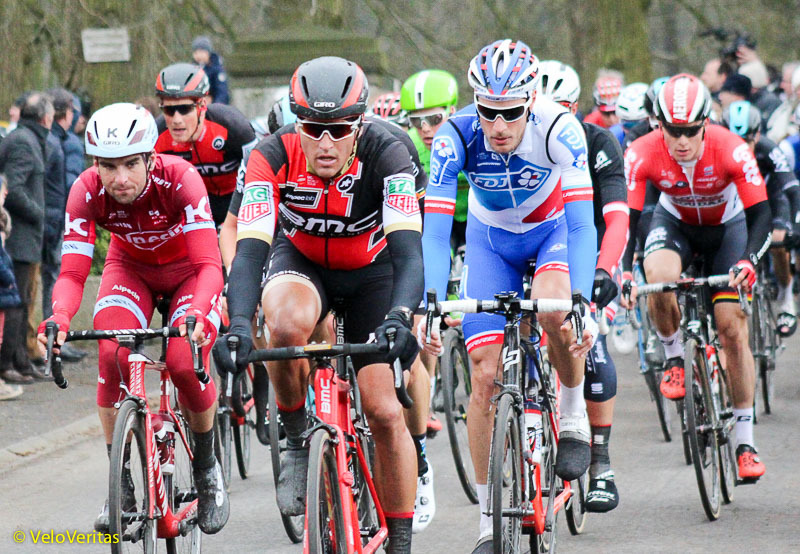 Sunday and we headed up to Kuurne where you can get a right good look at the bikes. 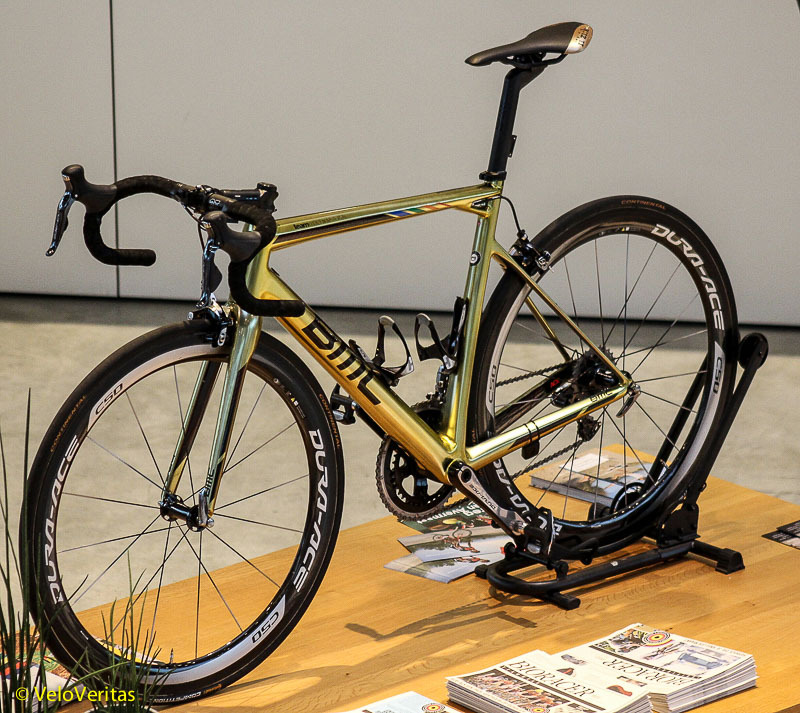 We like the F des J Lapierre ‘triple triangle’ frame – reminded us of those GT’s which Lotto used to ride. Kristoff – the bull-like Norwegian wasn’t on his best weekend despite the efforts of his fans to pump him up. 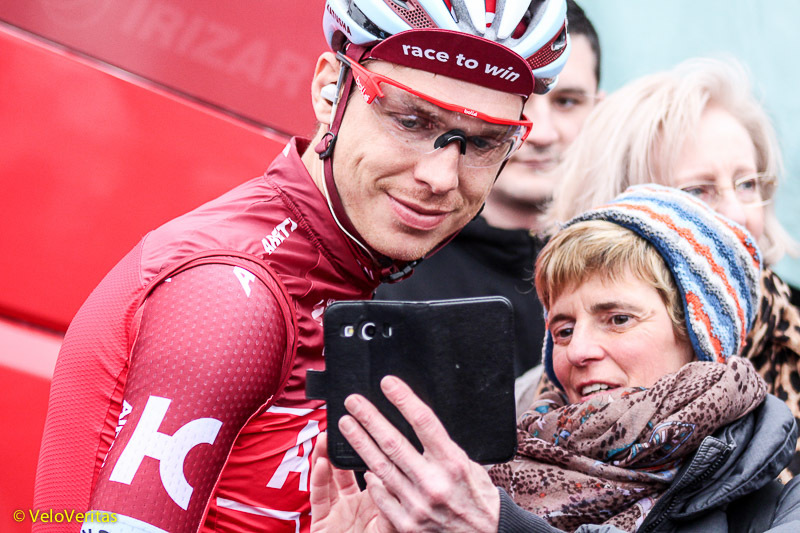 The team with the ‘love it or hate it’ strip – AG2R have bolstered their squad this year with Big Stijn Vandenbergh backing strong men Naesen, Gougeard and Bagdonas. Watch for them in the longer Classics. 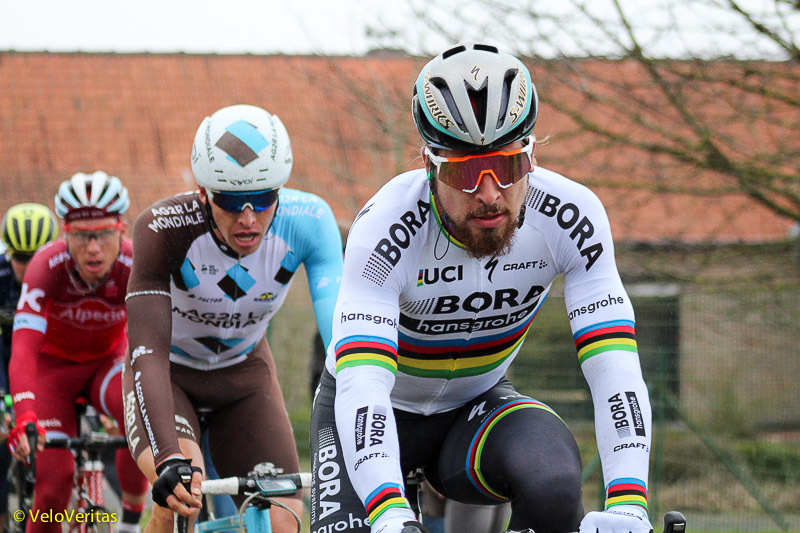 No longer the ‘nearly man’ Olympic Champion GVA defended his Het Nieuwsblad title and was well to the fore in Kuurne. And you know you’ve made it in Flanders when the caricature artists feature you in the shop windows. Not so ‘at home’ in the cold and cobbles of Flanders was 2017 Australian Road Race Champion, Miles Scotston. Sunshine and Oz on smooth tarmac are one side of the coin; on the other is an icy wind and The Flemish Ardennes cart tracks. Having watched Peter on Sunday we were left with Monday to fill before the flight home. The Flanders Cycling Museum in Roselare is being refurbished so they’ve relocated temporarily to the ‘Paterskirk’ [Father’s Church] in Roselare. The main shrine is to Eddy Merckx of course, but we’re not sure his rivals of the day saw him as a Deity, more a Devil. The confession box contains Lance confessing to Oprah on a continuous loop – we felt this may be getting very close to blasphemy but we’re not religious men. And we’ll close on another serious note. Belgium’s Jempi Monseré was a wonderful rider; the 1970 World Champion and 1969 Tour of Lombardy winner crashed head-on into a car which had infiltrated the closed roads of the Grote Jaarmarktprijs in Retie on March 15th 1971. Jempi died on the spot and the images of him lying on the tar, rainbow jersey on his back with team mates De Muynck and De Vlaeminck looking on helplessly reminds you that it’s not a sport for the faint hearted. Tony has time for a fan. 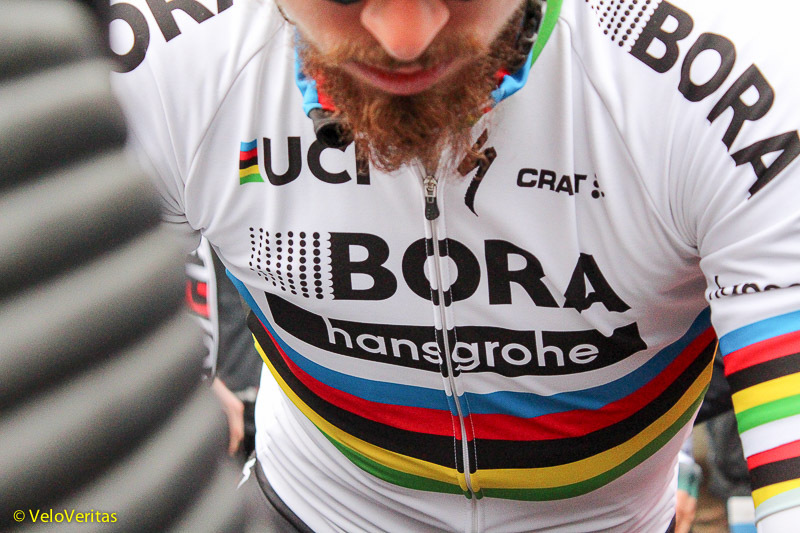 Sagan’s beard on the way to sign on. Phil Gilbert and Dan McLay. Dan Oss leads the race. The struggle to stay on the wheel. 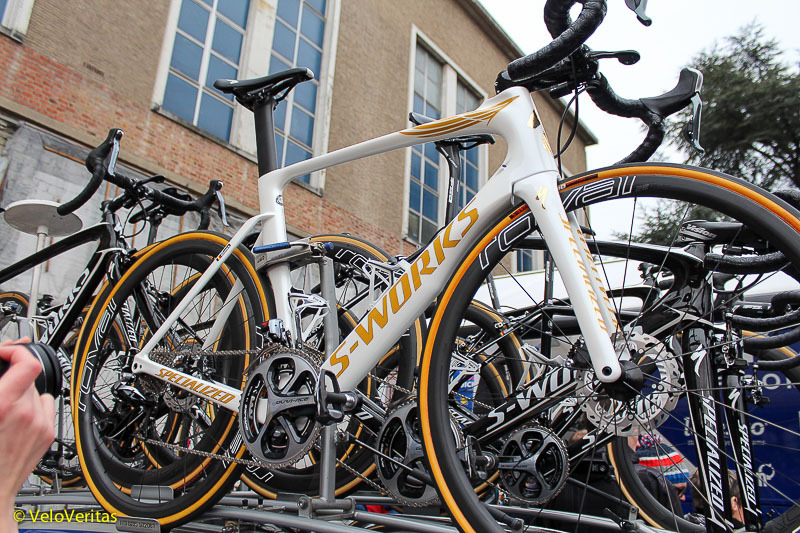 Tom Boonen’s S-Works, with gold decals and discs. VeloVeritas waited until we were sure that James McCallum was displaying no symptoms of dengue fever before we caught up with him at Starbucks for a chat about his third Commonwealth Games.